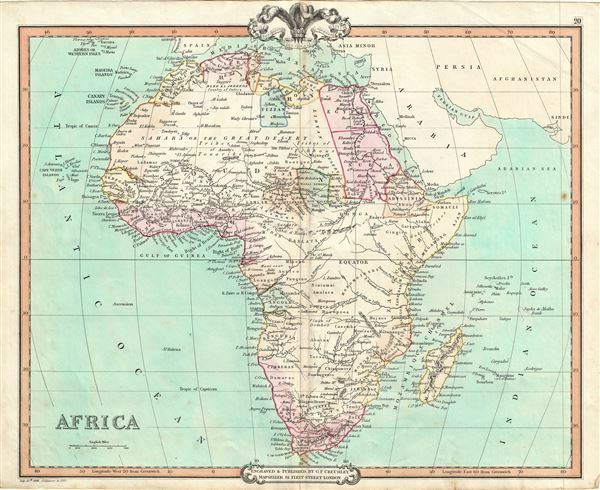 This is a beautiful 1850 map of Africa issued by George Frederick Cruchley. It details the continent of Africa, including Madagascar, on the cusp of the great exploratory expeditions of the mid-19th century undertaken by Speke, Livingstone, and Stanley. Though European colonies and outposts dot the coastlines, much of the interior remains unknown, even speculative. The 'Supposed Mountains of the Moon' stretch across the continent - a relic 5th century B.C. speculations regarding the source of the Nile. Lake Malawi, near Mozambique, appears in embryonic form, no doubt drawn from indigenous and missionary reports, but gives some hint of the Great Rift Valley lakes soon to be discovered. Very good. Minor wear and toning over original centerfold. Blank on verso.